Rose is perfect for the holidays! Rose wines are perfect for the holidays! Don't forget to have some good Rosé wines on hand for the holidays. They are universally liked by guests and pair with almost anything. Excuse this email if it seems repetitive. This newsletter is a correction of the description in the last newsletter for the Chateau de l’ Engarran Rosé 2017. Thanks for understanding! Please call our tasting room to inquire if expedited shipping is available in your state. This rosé has an alluring female touch that makes it irresistible. The guests in our tasting room are raving about the flavors and softness of this rosé. Diane Losfelt makes this lovely wine from 80% Grenache Noir and 20% Cinsault. Give yourself and your friends the gift of this beauty that is made to go with food. She will shine alongside a pork roast stuffed with prunes or port-soaked dried cherries! Santé! It is most important to pair your wine properly with what will be on the menu. The Princess suggests giving a prune stuffed pork loin a try! Serve with baked apples and sautéed spinach with orange-butter and toasted pinenuts. The Soif Ideal, La Dame and this l’Engarran rosé will all be delicious with this recipe. Enjoy with best friends! Get the full recipe HERE. News Flash: Borie la Vitarèle. Cathy Izarn and her husband Jean-François created Domaine Borie La Virarèle in 1990. They quickly became one of the most delicious and internationally recognized domaines in the whole St. Chinian appelation. Jean-François died in a tragic farming accident in 2014 which shocked the whole region. Since then Cathy took over on her own assisted by their daughter Camille. We are so pleased to announce that Camille‘s first vintage, the 2015, just received 1st place (Midi Rouge) and 6th place (Les Crès) in New York at the St.Chinian, Palmarès Competition. Way to go mother and daughter team!!! Want to have something different than the same ol' holiday food? Why not add a citrus kick? Check out our pairing below! 2017 SOIF L'IDÉAL The structure and acidity of the grenache and vermentino blended with the honeyed pear and peach flowers of the Roussanne and Viognier creates a wine that is lively, friendly and engaging. 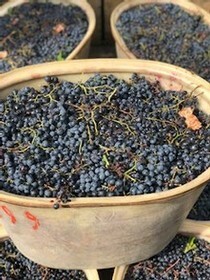 The grapes are grown at a higher altitude of 300+ meters (1,000 feet), are hand harvested and then slowly pressed in a cool temperature to maintain all of the flavors. Then, aged on the lees this wine finishes with a smooth, nut bread hint. salsa a try. The usually balmy Languedoc, which claims 300 sun-kissed days a year is well known for it's sea-port towns, and fresh seafood. Get the full recipe HERE. Our Youtube Channel is ready for view! Our Youtube Channel, Princess and the Bear Wines, has launched! We will be posting a new video every Friday talking in more depth about each of our wines and our love affair with the winemakers! Please subscribe, like and share with your friends who love delicious, affordable and/or cult wines and help us spread the word about these amazing, passionate winemakers! The holidays are all about family, friends, food and fabulous wine! Read below to find our red wine and holiday recipe pairings! With this silky delicious red wine made from 50% Grenache, 30% Carignan, and 20% Syrah try the famous Eads Family Cornbread-Sage Turkey Stuffing and Giblet Gravy Recipe from Lela Carr Eads and Sarajane Eads. To learn how to create this dish, just click HERE. This Terre des Dames is truly the “Land of the Ladies”. This excellent female winemaker, Lidewij Van Wilgen, left everything, including an executive career, in Holland to become a winemaker in the Languedoc “ The new world of wine in France”. In the Financial Times, celebrated wine scholar Jancis Robinson classed Terre des Dames amongst her “Languedoc favorites”. Find out more about Lidewij and Terre des Dames. Check out our fabulous video about this stunning winery HERE. The domaine is owned by Jacques Calvel, a man with an eye for excellence. Jacques was born in in a very small village, Rodome, in the French Pyrénées . After Engineering studies in Toulouse, where he also played rugby, the most popular regional sport, he started his career in Information Technology with IBM, working in France and the USA. He left IBM and began managing small teams, developing advanced software programs in the area of Numerical Mapping, Computer Aided Design and Manufacturing and Document Management. In 1987 in Geneva he created his own software firm which quickly expanded to Basel and Zurich covering Switzerland. In 1999 he sold his business to the Thalès Group (in preparation for the year 2000 bug!). In 2001, he left the IT world for good and this gave him the freedom to bring his technical mind and passion for excellence to the world of sparkling wines. 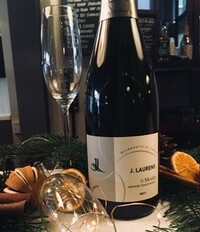 In 2002, Jacques bought the Domaine J. Laurens located near Limoux, in the foothills of the French Pyrénées, from a Champagne-based sparkling wine expert, Michel Dervin. Michel was known as an excellent winemaker but without funds to have his own domain in Champagne. Thanks to the support of his family and friends Michel created from scratch Domaine J.Laurens at the beginning of the 1980’s. He defined the 2 key cuvées which made the reputation of the domaine, which are still made and sold. Michel decided to sell the domaine and Jacques saw the opportunity to come back close to his native region. During his last year Michel directly trained Henri Albrus who became the new winemaker, and Michel supported Henri for a few years after leaving the domaine. Jacques now had a new opportunity to use his skill and life experiences developed in the technology world (worldwide commercialization, team building, management). 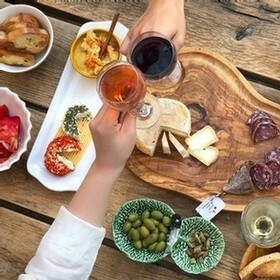 In addition, wine is a business where conviviality and friendship are fundamental and a part of everyday life! In only a few short years Jacques assembled an excellent team covering all areas of needed expertise: caring for the vines, producing fine and elegant sparkling wines made in the traditional method and marketing and selling sparkling wines worldwide. 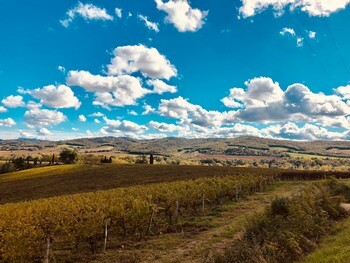 His main goals have been to produce consistently high-quality wines year after year, to produce only sparkling wines and to sell only through professional networks who provide great service to customers. In addition to his lofty goals, high standards and accomplishments, Princess and Bear would like to say that he is a wonderful human being. As we personally complete the one-year cycle of forming our business and bringing it to fruition in our first shipment which is headed west across the Atlantic ocean at this moment, we also were here in France to watch the cycle of the vine which is the lifeblood of this region. 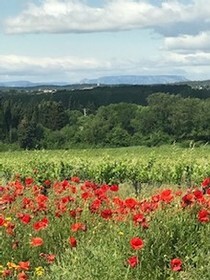 Take a look at this short video to give you a taste of the real Languedoc from our eyes. https://youtu.be/E4rG-8Ky0HQ. The spring is like a huge inhale and expansion full of life. Tender lime green leaves on the vines, flowering wild herbs, and budding fruit and almond trees filling the air with their scent. All of the newness and potential that will become the fullness of the summer. And now as fall sets in, the earth, the vines and the people give a big exhale as the winter chill approaches. Here are some of our favorite shots of the cycle: early spring greenness and blossoms, the glorious poppies of summer, the harvest and now the fall as the cycle closes. Fall is a wonderful time to be with your family and friends, because it’s our inside time. Time to renew ourselves and time to reconnect with all the people who in the end give our life it’s true meaning.